We are engaged in providing clients with excellent variety of Sun Cured Natu Tobacco. 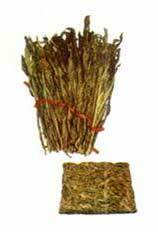 This range of Sun Cured Natu Tobacco is primarily used for cigarette blending and for hookah tobacco paste making. This range of Sun Cured Natu Tobacco undergoes stringent quality control measures to make the range free from all drawbacks. The leaf is initially air-cured (shade-cured) for 2 months followed by pit curing for 4 to 5 days and then bulked till the leaf develops brown colour and has a pungent odour.